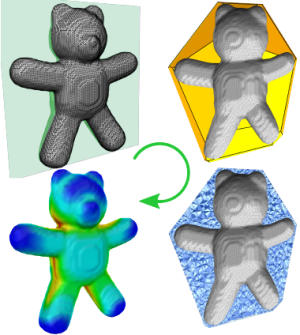 In the context of shape segmentation and retrieval object-wide distributions of measures are needed to accurately evaluate and compare local regions of shapes. Lien et al. proposed two point-wise concavity measures in the context of Approximate Convex Decompositions of polygons measuring the distance from a point to the polygon’s convex hull: an accurate Shortest Path-Concavity (SPC) measure and a Straight Line-Concavity (SLC) approximation of the same. While both are practicable on 2D shapes, the exponential costs of SPC in 3D makes it inhibitively expensive for a generalization to meshes. In this paper we propose an efficient and straight forward approximation of the Shortest Path-Concavity measure to 3D meshes. Our approximation is based on discretizing the space between mesh and convex hull, thereby reducing the continuous Shortest Path search to an efficiently solvable graph problem. Our approach works out-of-the-box on complex mesh topologies and requires no complicated handling of genus. Besides presenting a rigorous evaluation of our method on a variety of input meshes, we also define an SPC-based Shape Descriptor and show its superior retrieval and runtime performance compared with the recently presented results on the Convexity Distribution by Lian et al.